This reliable piece of hardware delivers full VR support. Despite a few usability niggles, the Wacom Cintiq Engine Xeon is a powerful engine that turns your device into a high-end workstation. If you are a Cintiq user and are looking for a new workstation, or a move from Mac to PC, then the Cintiq Engine offerings are well worth some investigation. There are two options available, but the one tested here is the Xeon quad-core model, with 32GB and a half terabyte SSD hosting Windows 10 Pro. Rather than listing the specification and the results of a few benchmarks, I’ll try to give a more 'experience-based' review, as the variety of software and attached peripherals will make any measurements less valuable. 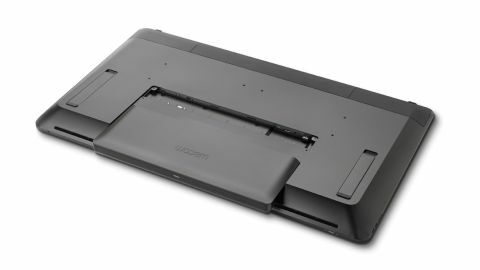 The unit itself is a slim box that slides into the back of the Cintiq and adds some ports by way of 2 USB-C, an Ethernet, HDMI and DisplayPort, complementing the existing USB 3, SD reader and audio output of the Cintiq. The engine is also user upgradable, so changing RAM and drives is easy as can be. Boot-up speeds are just a few seconds thanks to the SSD, and the system feels fluid and responsive. 3D applications run smoothly, with excellent viewport performance and rendering speeds, thanks to the 6GB Quadro P3200. Maya, Megascans Mixer and Cinema 4D all run really well, so anything else should be equally fast. For those wanting to work with 4K video, DaVinci Resolve (now with Fusion) runs at real time, even with multiple nodes in the colour page, editing even directly from an external Samsung T5 with RAW footage. Increasingly important for devices aimed at this market is the need for full VR support, and this is one area that combined some frustration with great results. Getting an Oculus Rift and controllers to work was a bit of a painful experience, and it took some investigating to discover why it wasn’t simply a case of plug and play, which has to do with how USB controllers work. To successfully set up you will need to use a USB 3 hub plugged into the USB-C port on the engine, not the ports on the Cintiq, which get downgraded to USB 2 when the engine is used. Not all hubs are created equal and I found the only one of a handful to work for me was a Lenovo one. Once I worked through that (with a little support from Wacom) the VR/tablet combo worked like a dream and the hardware is more than capable of running anything that you can throw at it, from detailed games to content creation software like Gravity Sketch, Medium or Quill. I haven’t touched on using the tablet as an input device much here, as really that’s a separate item, but it’s worth closing by saying that the two are at the top of their game, complementing each other and making for the centre of an ideal workspace for any digital content creation studio. The engine may be expensive, but it’s powerful, reliable and is a perfect fit for the Cintiq. Once you get past a couple of VR niggles it is a solid bit of gear that runs smoothly for even the most intensive of uses. This article originally appeared in 3D World issue 244. Buy it here or subscribe.